Le Capitaine Wallis est attaqué dans le Dauphin par les Otahitiens. [Tome II Pl. 1ère.] - COOK, Captain James. Title : Le Capitaine Wallis est attaqué dans le Dauphin par les Otahitiens. [Tome II Pl. 1ère.]. Size : 7.9 x 12.5 inches. / 20.0 x 31.8 cm. 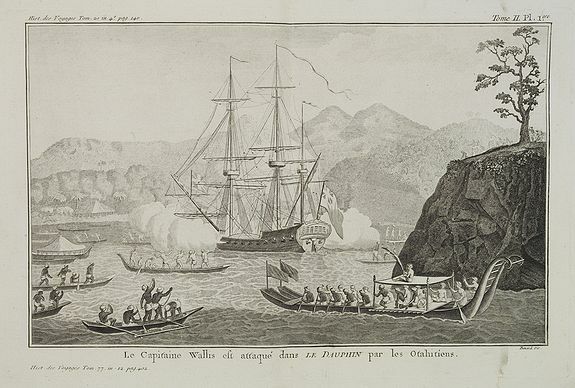 Description :Scene of an attack by local Tahitians on Captain Wallis' Dolphin ship off Tahiti's shore. Samuel Wallis (1728-95), a Royal Navy Captain and a skilled navigator was given command of H.M.S. Dolphin in 1766 with orders to circumnavigate the world and explore and chart the islands in the Pacific Ocean. Passing through the Magellan Straits into the Pacific in early 1767 he took a northwesterly course, charting the islands en route including Tahiti which he discovered in June 1767. From the French edition of James Cook's voyage. Engraved by Robert Benard, a very talented engraver, particularly of natural history subjects after his own designs and those of others, such as Redouté. His attention to detail give a very clear indication of the subject that is at its best, almost photographic. The Oxford Companion to Ships and the Sea. Edited by Peter Kemp. 1976.